1. Prepare your marinade and coat the fillets. Cover the bowl and leave in the fridge for at least 1 hour, or better still, overnight. 2. Preheat the oven to 180°C, gas mark 4. Cut two large rectangles of baking parchment and lay each out on the work surface. 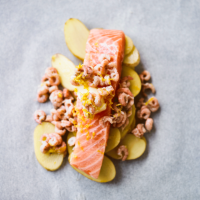 Divide the sliced new potatoes between each piece of parchment and top each pile with a fillet of salmon. Season, then squeeze over the lemon juice. Top each fillet with the cubes of butter, brown shrimp and lemon zest. 3. Fold the empty half of the parchment paper over the salmon and crimp the edges closed, as if making a square pasty. Repeat with the second piece of salmon, then put the parcels onto a baking tray. 4. Bake for 40-45 minutes, allowing an extra 10 minutes for the potatoes. The salmon should be tender and cooked through. Serve in the parcel, so none of the juices are lost, or transfer to plates and drizzle over the juices. Sprinkle with chopped chives to serve.